Embraced by kings and freedom fighters alike, Myanmar's peacocks have long been a national symbol of pride and resistance—but they are becoming ever harder to spot in the wild. Ornithologist Thet Zaw Naing is worried. Every year that goes by, Myanmar's national bird becomes a less familiar sight. "They always walk on the ground and they sleep in trees at night," he tells AFP. "And before they go to sleep, they always cry 'Oway Oway'. That's why people can know easily where they are and easily capture them." Decades ago the birds, with their bright green plumage and famously ostentatious male tail feathers, were ubiquitous. But like so many of Myanmar's most iconic flora and fauna, rampant poaching and habitat loss under decades of unaccountable junta rule has hit their numbers hard. For Myanmar, the declining peacock population is more than just a conservation tragedy—it's a blow to the national psyche. The bird occupies a lofty place in the country's culture. For decades it was the official symbol of Burma's last kings, the Konbaung dynasty. Their monarchs wore peacock insignia on their robes and famously sat atop the Peacock Throne until their rule was toppled by British colonialists. 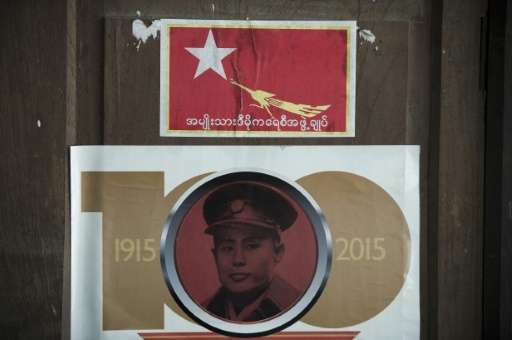 During his fight against the British in the early twentieth century, independence hero Aung San—the father of democracy icon Aung San Suu Kyi—created a magazine named the "Fighting Peacock". Years later, Suu Kyi and her National League for Democracy adopted the same bird as their party emblem in their long years of struggle against military rule. Whenever protests broke out on the streets of Yangon, peacock flags could be seen fluttering above the crowds. Now elevated to the role of Foreign Minister and State Counselor since her party swept to victory in last year's elections, Suu Kyi delivers press conferences besides visiting dignitaries in front of an embroidered peacock wall hanging. But some worry the birds will soon only be visible inside history books and political rallies unless action is taken. Having once ranged from India to Indonesia, the green peafowl, as its officially known, is in severe decline. The International Union for Conservation of Nature currently lists the species as endangered on their red list. "It has undergone a serious decline and the only sizeable remaining populations are found in dry forests in Cambodia, Myanmar and west-central Vietnam," the IUCN says, adding pockets still persist in northern Thailand, southern Laos, China's Yunnan province and on Indonesia's Java island. It is believed to be extinct in Bangladesh, Malaysia, peninsula Thailand and India—with the exception of a few individuals occasionally encountered in India's far northeastern Manipur state bordering Myanmar. The Ministry of Environmental Conservation and Forestry in Naypyidaw says the birds are protected under the Wildlife Act of Myanmar, which prohibits their capture or killing. 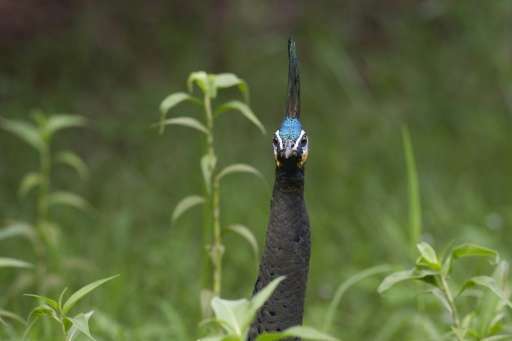 But according to wildlife experts, the law is not properly enforced, and many people in rural areas are unaware of the peacock's legally protected status, poaching them for their eggs, meat and bright feathers. 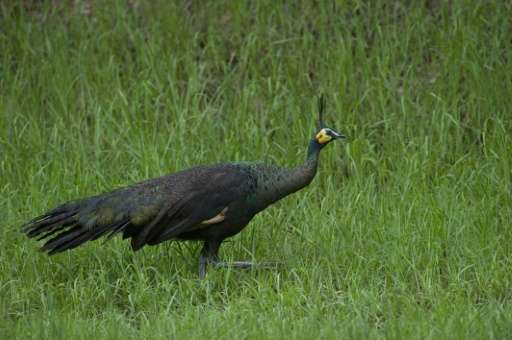 Greater public awareness of the peacock's plight, particularly in rurally areas, will be critical in bringing Myanmar's unofficial national animal back from the brink, says U Thet Zaw Naing. 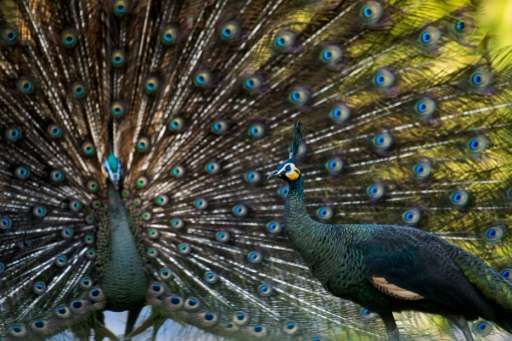 "The most important thing is to educate the people about how these peacocks are precious for the people and how Myanamar should be proud to have peacocks," he said.